I want to share a project with you that I worked on last week and finished up over the weekend. 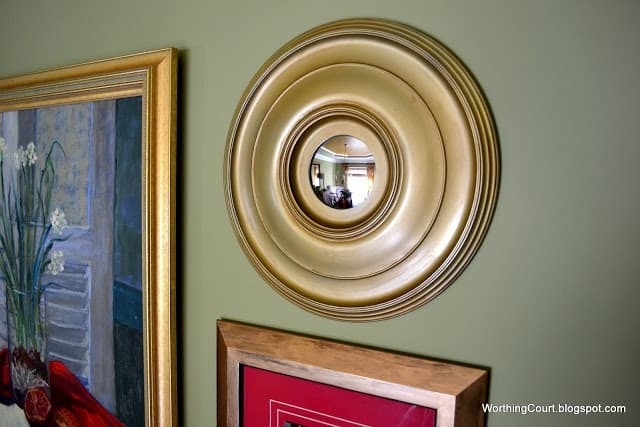 I love the look of a small convex mirror inside a thick, chunky frame. I wasn’t willing to pay retail for one, so I decided to try making one myself! It was easy and here’s how I did it. Here’s a closeup of the convex truck mirror box. Step 1. 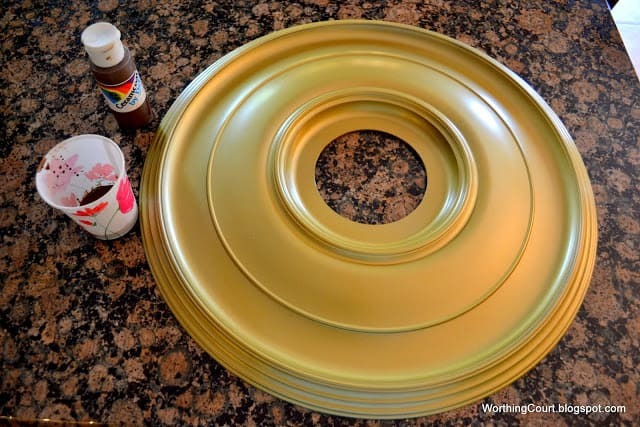 Spray paint the ceiling medallion. It took two coats for me to get sufficient coverage over the dark brown. Step 2. 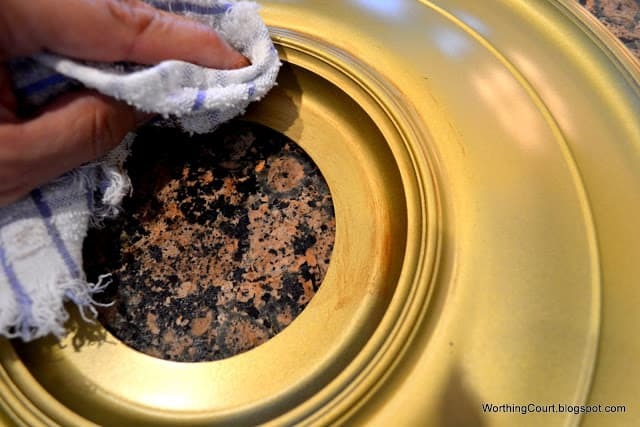 Glaze the ceiling medallion using Burnt Umber craft paint that has been thinned down with just a tiny amount of water. I used the wipe it on, wipe it off method until I achieved the amount of glazing that I liked. Step 3. 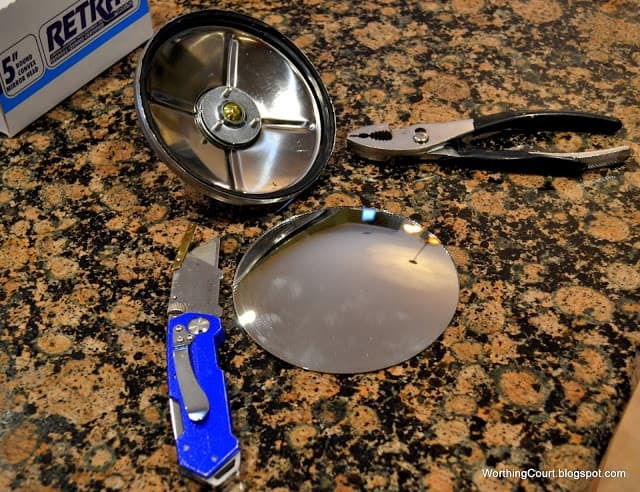 Very carefully, remove the mirror from the metal encasing by first cutting away the rubber gasket with the box cutter. Make sure you cut away from your body not toward yourself! Step 4. Again, very carefully, pull back the metal edges with the pliers. Do this all the way around the mirror. What you’re trying to do is to free the mirror from what is holding it in place. Step 5. 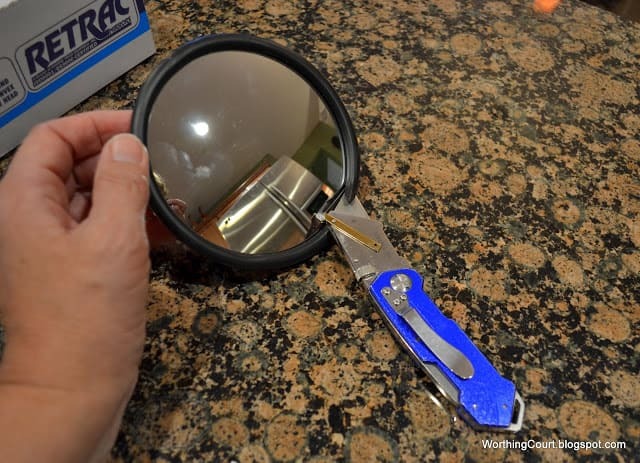 Ever so gently, slip the edge of the box cutter behind the edges of the mirror to gently lift it out. This is what you will be left with. Step 6. 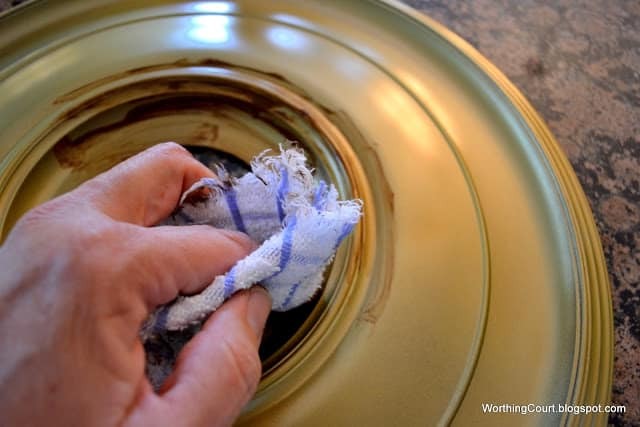 Hot glue the mirror to the back of the ceiling medallion. I used stick on Velcro Command strips to hang the mirror on the wall. It doesn’t weigh very much at all. I actually made two of these and will show you where I hung them later in the week. Update: Click here to see where I used these mirrors! Wow Suzy…this is a great project…How did you ever come up with such a creative idea!!? ?…Looks wonderful on your wall! Awesome! You are so smart!!! I can’t wait to see the entire wall grouping! Wow, great job and a fantastice idea. I love it! I love this idea – looks so nice on your wall. When I first saw your mirror on the thumbnail I thought you had found a wonderful treasure! But, you made a wonderful treasure instead! Very nicely done! Oh what a great idea! 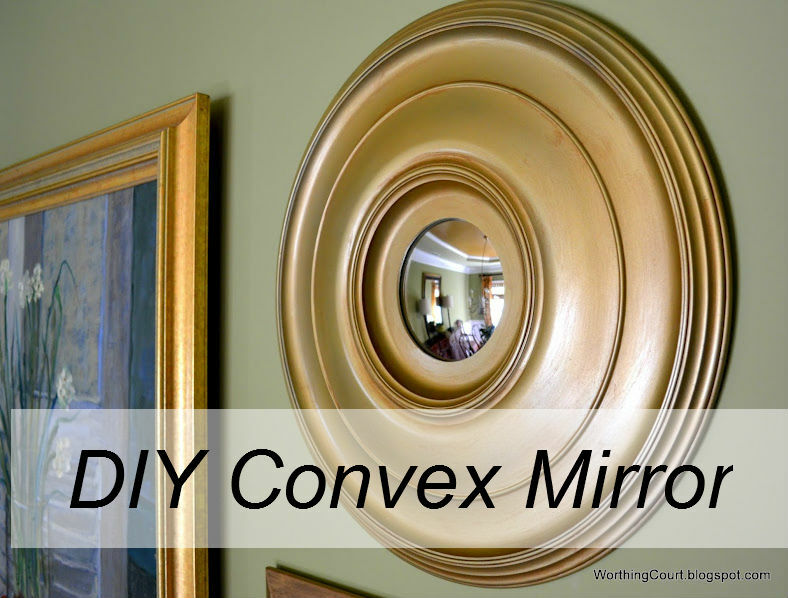 I have always loved convex mirrors but they are expensive. So very clever. Richard from My Old Historic House. Oh my gosh! LOVE THIS SUZY! Great job my friend! Suzy, what a clever idea!! Convex mirrors can be so pricey; but you did a wonderful job on this! Awesome! Suzy, I think I know where they are hanging. Love it. Glad to know another Rub ‘N Buff fan! Brilliant! Pinning this one for future reference. Oh my goodness … that is genius! So Great, So Simple. I can do this. I am going to show this to my daughters. You can do anything. What a clever idea! I never would have thought to use the truck mirror, but I love the finished look of your project. 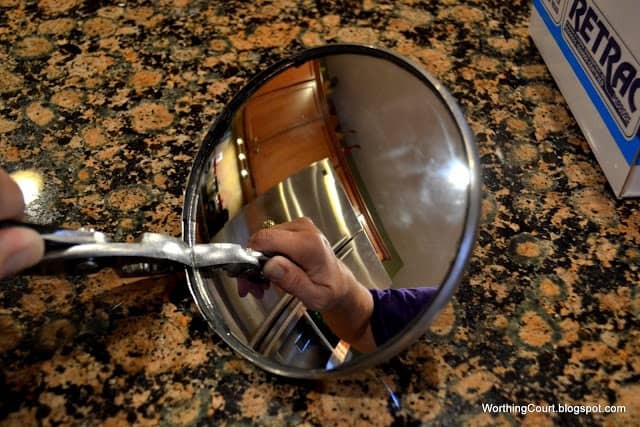 Thanks for sharing this tutorial at Your Cozy Home Party so others can learn how to make their own mirrors on the cheap! I love this! Makes me wonder why I didn’t think of that! 😉 Would love for you to share with my readers at my linky party! Genius! Absolutely love that you used a truck mirror! Oh that is just beautiful!!! What a clever idea!! 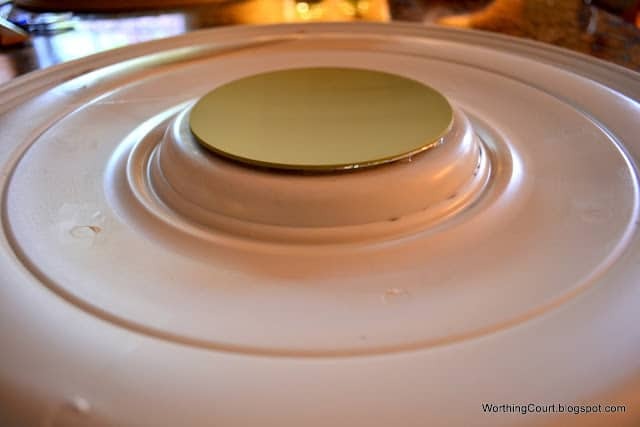 I have one of these medallions I bought with the same idea, only I used a flat mirror and it looked so…flat! 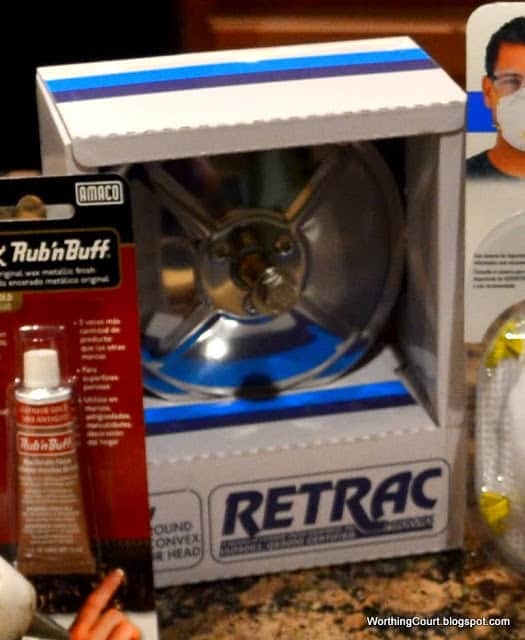 You’ll find me at the auto parts store tonight. Gorgeous mirror! I love it. Your tutorial makes it look doable even for clutz’s like me. Thanks. I really love this, you did such a great job! Thanks, Tami @ Curb Alert~! A truck mirror? Genious! This is an awesome project! Thanks for all of the tips and pointers, too! What a great idea. Already pinned it. Reeeeeally???!! That is just genius! Look out Mack® Truck Company! You’ve got three mirrors I want for a weekend project! This is fantastic! That is some great creativity – good thinking about the truck supply shop. I love this! 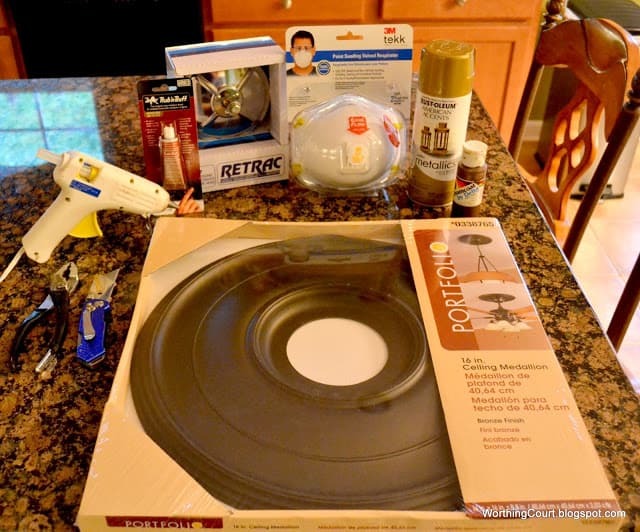 I saw you featured on addicted 2 decorating, and I just had to stop by and check out your blog. I am your newest follower. truck mirrors=genius c’mon, how’d you think of that one? brilliant. anyway. I have been wanting to make a mirror with a ceiling medallion for a while, but never would’ve thought of using a convex mirror (i wouldn’t have known where to find it) wow, I’m blown away. They look just great in your dining room! Awesome idea! I have 2 truck mirrors I bought at a thrift store ages ago and haven’t done anything with them. Now I have some inspiration! This is one of the most clever ideas I have seen in so long!!! I am pinning this next and making one for myself, and a whole bunch to sell! I love it when someone shows how to make something out of average things, that are just so out of my price range in catalogs. Thanks for sharing! Such a great project! I love convex mirrors! 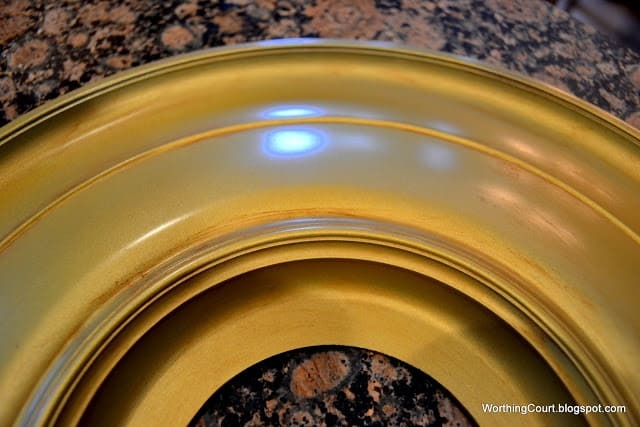 I used a similar one for an outdoor mirror…had to order it from a security company! 🙂 Funny where we find our supplies! Thanks for sharing! Hello, I came accorss this wonderful project while working on a Baroque project for my interior design class. I’m definately going to try this — if only I knew where to put this in my house. I am very impressed with the finished product. Looks quite high-end.